Creating a search engine for your web site does not have to be difficult! 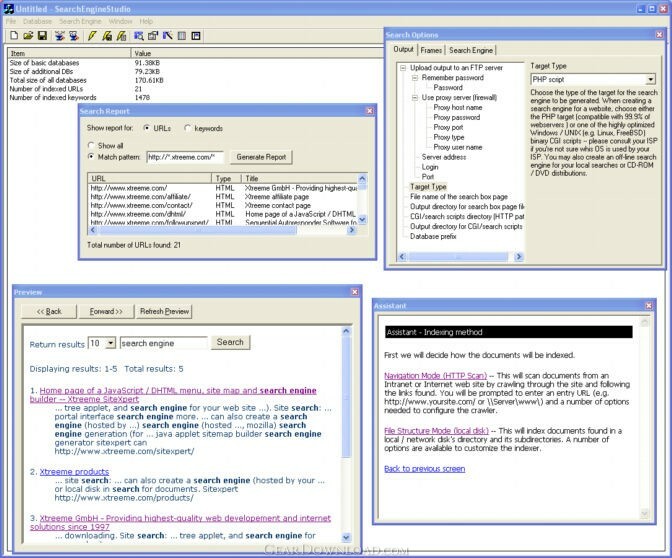 Search Engine Studio automatically indexes your web site (with a HTTP crawler, an FTP / local disk scanner, or using an XML file) and then creates a professional, ultra fast search engine for your website (as a binary CGI script or PHP script) or an offline search for CD-ROM / DVD distributions. No installation on server required thanks to a built-in highly optimized database engine! The difference between Search Engine Studio and other search engine generators is that it uses its own highly optimized database engine so there is absolutely no installation required on the server. All you need to do is follow a few easy steps of the assistant to have the program automatically index your website and then upload the required files to your server. Everything the search engine needs will be located on your server without any references to other websites to ensure best possible performance. The search results will not display any ads or other unwanted content and for the first time you can fully customize the displayed result page appearance. This software indexes dynamic (e.g. ASP, PHP, CGI, JSP, ColdFusion) and static HTML pages, PDF documents, Office (Microsoft or OpenOffice), Flash, media (images/audio/video), archive, PostScript, CHM documents. The features include: easy integration with existing web site, automatic updates of databases, Google-like content preview with keyword highlighting, phrase search, advanced boolean search (AND, OR, NOT, parentheses), wildcard search, result filtering, customizable result ranking, frame support. What's New: *A possibility to display search results on the same page (through Ajax). *Search hints box shown when a user types a query text. *The SSH (SFTP) and SSL/TLS (FTPS) protocols are supported. *A possibility to index password protected areas. *Date filters work in PHP and Java output types. Limitations: All features of the full version are enabled in the demo so you can fully test the software, also without time limitations. The only difference is that the links to documents on the search pages will be modified (with a redirection to the target page after a few seconds). This download (sesdemo.exe) was tested thoroughly and was found 100% clean. Click "Report Spyware" link on the top if you found this software contains any form of malware, including but not limited to: spyware, viruses, trojans and backdoors. External Link Promotion 2.21 - Easy powerful web link popularity & google pagerank boost tool. OBB2 2.0.0 - OBB2 Helps you to stay on top and get the best results with your site. Warden 1.44 - Password protect your website and manage user accounts in three easy steps. Link Checkup 1.3 - Monitor advertising links, banner ads, and reciprocal links with ease. Rocket Pinger 1.5 - Drive Instant Massive Traffic To Your Sites The FREE and Easy Way! SEO Administrator 5.2 - A complete set of SEO tools for successful website promotions.